﻿There are very few large insects that roam the planet today, and most that we see barely measure an inch or two, hence to be able to photograph all the details, we have to get really close. If you’re under a tight budget, the best bet to photograph insects and spiders up-close is a point-and-shoot camera with more than 5 Megapixels and a macro range of at least 5 centimeters (these two particulars are always provided in the specifications). Such cameras are no match to the DSLRs with macro lenses, but they serve a great purpose, thanks to their cheaper price, light weight, and compactness to carry anywhere without worrying about changing lenses all the time. Photographing insects is not as easy as it seems. Although easier to approach than birds, their small size makes it difficult to get all the parameters right. Some of these were discussed in the How to point-and-shoot: Butterflies article, but not all insects are the same. Some are really small, some really shiny and some extremely shy. In order to get a perfect photograph, you might have to wait for quite some time until you find one at the right time and the right place – when the light is right and the background perfect. ﻿As a naturalist, I always aim to photograph the subject from all angles possible – from top, from the sides and, if possible, the head region (even the shape and colour of the antennae helps in identification!). This aids in identifying the subject as well as serves the purpose of a photographic record which might help in differentiating various morphs of the same species. ﻿All shiny insects, especially beetles are a slight challenge while photographing. Their glossy exoskeleton is highly reflective, resulting in a photograph showing false colours of the beetle. This problem is more prominent during a sunny day and while using a flash. I absolutely welcome a cloudy day while photographing such subjects, because clouds act as natural light diffusers. If it is too dark, I use a two-layered translucent paper over the flash to diffuse the light. If you do find yourself with a shiny bug on a sunny day, try to cast a shadow on the subject using your hand, but if it is too sensitive to shadows, just go for the shot! I usually use flash even on a sunny day, because it helps to light up the dark shadows casted by the sun. Let’s take the case of the picture 4. 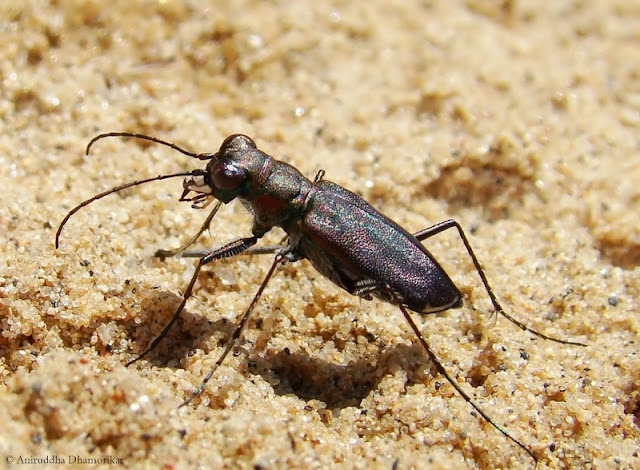 I saw this Tiger Beetle only once and that too, on a bright sunny day. Had I not used flash, the image would show high contrast between light and shadows, with shadows being too dark and the surrounding too bright. To lessen such an effect, use the flash so that the details in the shadows are visible as well. ﻿It is such incidents that result in accidentally beautiful photographs. Had I not used flash, the wings would have blended into the dark surrounding, and the brilliant violet sheen would have gone unnoticed. This goes to show how important the use of flash is in photographing such subjects. Dragonflies and damselflies are among the insects that are long and slender – just like Praying Mantis and grasshoppers amongst others. Hence the plane of the angle is important in order to get the entire body in focus. I have discussed this issue in the How to point-and-shoot: Butterflies article. Although it is not a hard-and-fast rule, especially if you’re targeting only one part of the body, I find it visually appealing to photograph such subjects with their entire body in focus. And as I discussed earlier, it was always better to photograph from all the possible angles. Since dragonflies keep their wings apart, photographing them from top is similar to photographing butterflies with wings at rest, but it’s tricky to photograph them from the sides. 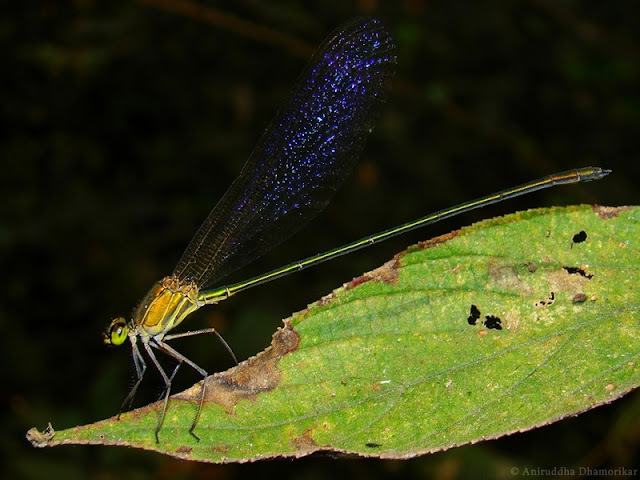 In such situations, focus on the body of the dragonfly instead of wing tips. This will blur the wings, and keep the body in focus. ﻿The above image of an ant was taken in a similar way. What was tricky about the image was to bring out as much details as possible on the ant, by keeping the Mealy bug from overexposing to the light. 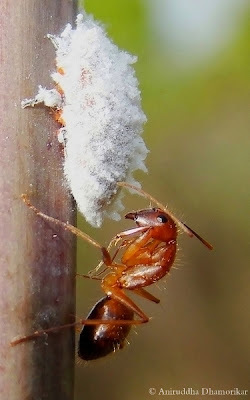 And although the Mealy bug was overexposed, the ant retained details as per my camera’s standards. When you come across a small insect sitting on a stick or on the edge of a leaf, you can get a bit closer. The trick is to keep the subject a little higher in the frame (about half or two thirds way up). By doing so, the flash light will not be blocked by the lens, thus illuminating the subject without casting the shadow of the lens. Photographing spiders is very similar to what we discussed above, but there’s one point crucial for any naturalist while photograph spiders – their eyes. I always make sure to photograph the eye-pattern of any spider, because every spider family has a unique eye-pattern, which makes identification a little easier. 6. 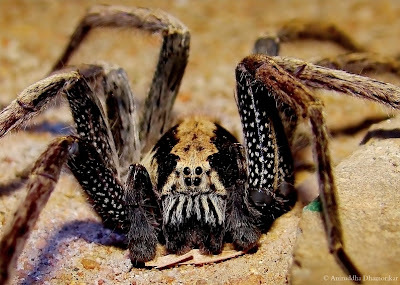 Wandering Spider, Ctenus sp. ﻿Although it will not provide great results, a cropped image will yield enough information to help in identifying the family to which the spider belongs. Photographing the entire body dorsally might aid in identifying the genus. The shape and structure of the web also aid in identifications. Use the same technique of keeping more distance between the subject and the background to yield a softer, less cluttered background as discussed in previous articles. While I primarily focused on how to photograph insects and spiders from a naturalist’s perspective, there are ample of artistic opportunities while photographing insects up close. You have probably tried using a hand lens in front of the camera’s lens to get photographs of really small objects. If not, you must try it, for it works exceptionally well with any point-and-shoot cameras. This technique can be used to photograph insects, but you need a really still insect and really steady hands. I have used this technique to capture details of moth wing-scales and antennae. Although the photographs don’t turn to be exceptionally good, the details are good enough for such an inexpensive trick. ﻿As the digital cameras revolutionized photography, it has also helped increase public awareness about biodiversity. 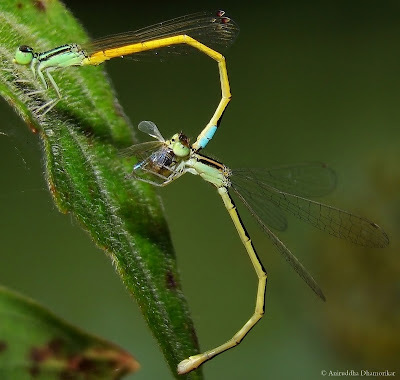 It is through photography that we can reach out to people, educate them about the benefits of having beneficial arthropods such as Dragonflies and spiders around. It is a way to eradicate misconceptions that people hold such as dragonflies bite deliberately. In fact, we’re more likely to be bitten by a dengue-carrying mosquito than by a dragonfly! 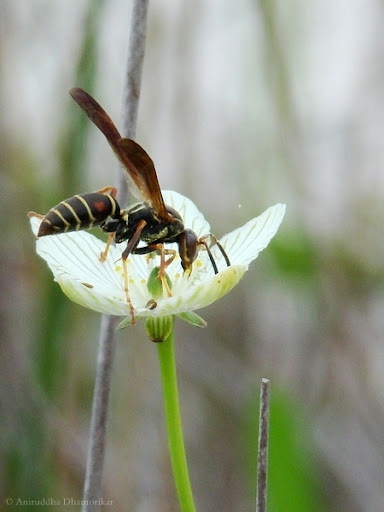 Photography is also tool to educate people about the beneficial and pest insects. This is especially helpful for farmers, gardeners and horticulturists, who have to deal with pest insects. It is also interesting to document insects visiting the backyards, and if you haven’t already, try to explore your backyards or balconies, for you may find really exciting bugs right under your nose. Happy exploring! 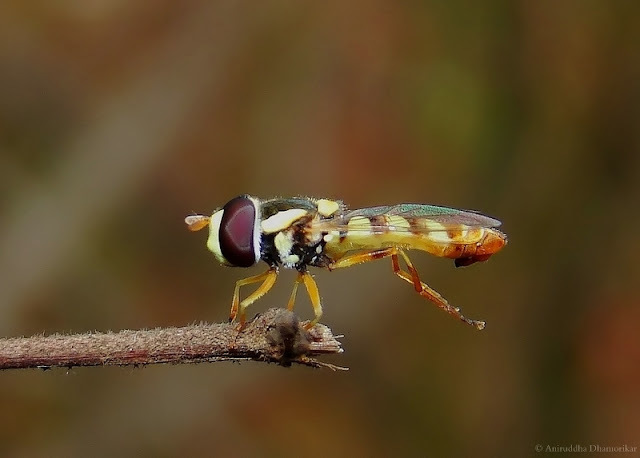 This is a very good primer on getting the most out of point-and-shoot cameras with insect photography. Nice job! Your tips are always useful. I'm getting over exposed images with my cannon IXUS 105 (a worst choice, I have ever made), even though I have set the exposure to -2. Hoping your tips will help me to overcome this problem. If possible please give information about the best available cameras, under different budgets. Thank you for the advice birdy. I will try my best. You might want to try a flash diffuser if the flash is too harsh. Very absorbing post, though I'm not sure how much I'll be able to apply all that I've read using my Lumix FZ25. Enjoyed your blog! Very nice photos. Emma pointed me in the direction of your blog. Always a nice experience to go through your articles. First thing, they are well put and second its very informative. Thanks a lot for taking out the time to write these helpful interesting articles. Thank you for reading and the appreciation, Chime!